Daily Illuminator: Get Into The Holiday Spirit With The Munchkin Comic Deck The Dungeons #1! 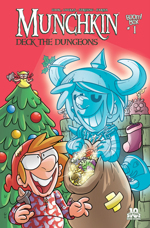 December 22, 2015: Get Into The Holiday Spirit With The Munchkin Comic Deck The Dungeons #1! Are you done with your Christmas shopping yet? Do you have Munchkin fans on your list? (It's only fair to include yourself.) If so, we have the perfect stocking stuffer for you! Boom! Studios has come out with a special Christmas issue of the Munchkin comic: Deck the Dungeons #1. Spyke and Flower decide to go dungeon delving on Christmas because the monsters are all too distracted to put up a fight. But things are not what they seem . . . Who is that shadowy figure following them through the dungeon? Why does Spyke hate Christmas? And what's in that eggnog, anyway? The comic is 32 full-color pages of Munchkin fun. It comes with an exclusive holiday-themed Munchkin card, and can be easily rolled up to slip into a stocking or fight off aggressive carolers. If you want proof of how cool this issue is before you spend your hard-earned cash, check out this review from BigComicPage.com.